We are a working Smallholding with livestock, close to all transport links. Second bedroom with bunk beds (cannot be split). Situated on a friendly working Small Holding with livestock. Hi our names are Craig and Angie Both Craig and i both lived in towns growing up, but 10 years ago that all changed, we decided to buy Watling Meadow Farm and turned it into our smallholding, over this time learning a variety of farming pointers. Our unique holiday let has been created with you in mind, we want our guests to experience the tranquil life that is our smallholding with the chance to experience the livestock that we keep along with the vast amount of wildlife that the meadow plays host to. Close to all road links and rail transport, ideal base for work, visiting friends and family, or even in between homes. Whatever the reason stay with us and you will experience alternative living at a relaxing pace. Situated right next to the Grand union Canal. Wake up to the singing of the birds then relax on the decking overlooking the meadow while drinking your morning tea. Small garden provided with childrens activity centre. The Grand union canal is right on the doorstep, so why not bring your kayak or canoe, sorry we do not supply these. This provided an ideal base from which I could show a friend around the area I had lived in for many years. We were impressed with the warmth and cosiness of the home which was a fantastic welcome as the weather was fairly poor throughout our visit. We had brought hot water bottles just in case but laughed at ourselves for doing so as we never once needed them. We had everything we needed and more. My daughter visited us and my little grandson absolutely loved the pigs (as did we). Craig invited us to watch them being fed and it was a shame we weren't able to do that due to other commitments...maybe another time! It was a very private spot and we loved seeing the barges on the canal and the sound of trains was great. This was value for money indeed and highly recommended. Polly and Sue where fantastic guests, they took great care of Meadow View, left it clean and tidy and was a pleasure to speak with. I would highly recommend them and I’d be glad to host them again anytime. A hidden paradise (Deeming family Walsall). Watling Meadow Farm is a hidden gem surrounded by beautiful countryside the farm itself is so peaceful making it easy for you & your family to relax & just enjoy they have a few pigs & a couple of dogs which were all very friendly. The owners Craig & angie were perfect hosts & Craig involved our 2 girls 12 & 7 when feeding the pigs an experience most kids would enjoy, they had a mini kids playground which our 2 loved also along with archery & football with a target point scoring goal the kids were not bored once. There is a huge field next to the lodge for the kids to run around in with a pretty little stream at the bottom of it just beautiful. We as a family truly enjoyed our stay at Watling Meadow Farm that much we didn’t want to leave & will definitely love to stay here again thank you Craig & Angie it really was a pleasure. Craig is a very welcoming and friendly host. Tea/ coffee/ milk and biscuits in arrival.children loved feeding the pigs PATCH / Gearge /BUSTER also Ollie and Oscar the farm dogs took to us straightaway and my son who HAD a fear of dogs found a friend instantly. So overall AMAZING HOSTS and BEAUTIFUL SITE.Bring your fishing rod and chillout. We felt at home right away. Cabin was clean, cosy and had everything we needed for our 6 week stay. The kids were able to run and play and were always welcome to help Craig feed the animals.Craig was always there to help at a moments notice.We were sad to leave, but will be back. It was lovely meeting you all and I'm so glad everyone enjoyed their stay. Thank you for your review and look forward to seeing you in the future. Take care Craig. 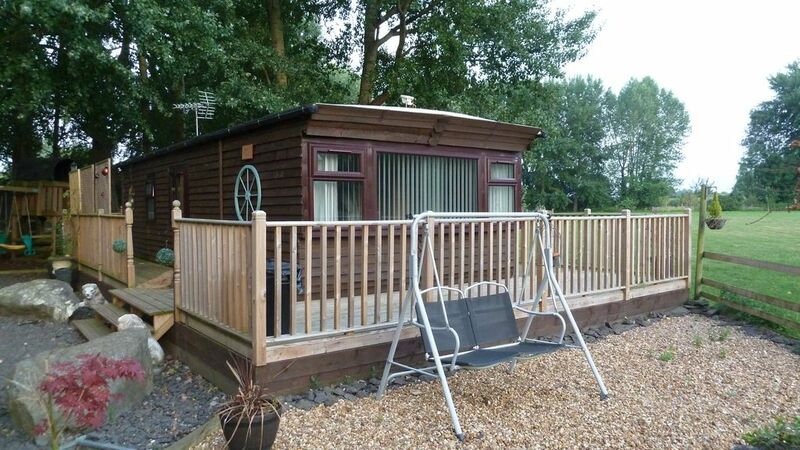 Craig was very friendly and welcoming and the caravan was very clean, well equipped and comfortable. The only reason I haven't given 5 stars was the unfortunate noise from the A5 which meant neither of us slept very well, ironically our toddler did 😊. However this appears to be a temporary problem due to traffic being diverted to the A5 while the motorway is closed at night for work. We enjoyed our stay and I would definitely recommend it. beautiful location thanks to craig for the welcome treats!!!!! animals are very friendly,good shops and takeaways close by. only slight drawback is the noise from the A5 .would recommend to anyone wanting a complete change of scenery. Come off at junction 16 of the M1 - Follow the signs for Weedon, at the Weedon Crossroads turn right. Keep going to just past the Dodford turn on the left, you will see a layby on your right indicate left you will now see a sign on the left Watling Meadow Farm. if you do need any information please just drop me an email, i will get back to you as soon as possible.